The last priestess of the winds. 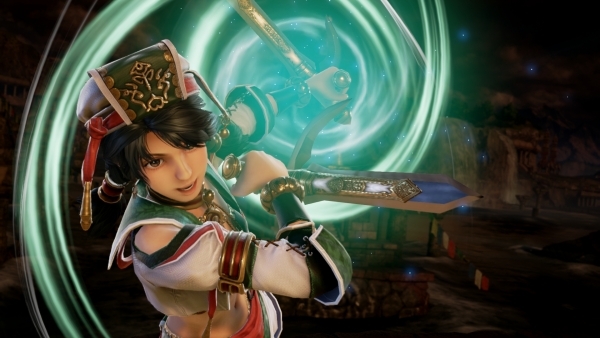 Talim, who first appeared in Soulcalibur II, will be playable in Soulcalibur VI, Bandai Namco announced. Hailing from the Village of the Wind Diety, a remote island tribe in South-East Asia, Talim was raised as The Last Priestess of the Winds, being the only daughter of the village shaman. Through this role, Talim learnt the ways of the ceremonial Wind Dance and grew up with the two ancestral elbow blades, Syi Sarika and Loka Luha, used for this sword display. Though trained with the blades as part of the island’s ancient ceremonies, Talim’s vast mastery of these weapons and control of the very wind itself, provided her with a fighting ability vastly beyond her young years. She spent her entire life on the island, until the day a stranger arrived in Talim’s town carrying a shard of Soul Edge itself. Talim could sense the danger of it just from this small shard and vowed to protect the world by returning it to where it belongs, even if this meant leaving her village and family behind. Soulcalibur VI is due out for PlayStation 4, Xbox One, and PC on October 19. Watch a trailer below. View a set of screenshots at the gallery.